A new article featured in a Psychology Today blog post is definitely worth reading. The blog discusses helping dogs remember training session by promoting arousal and the changes in the brain chemistry. The quick version is playing with your dog after a training session or skill will help the brain remember that. How many times do you reward your dog for a great nosework search during the search but when the session is over you just stop? I know I’m guilty of this… I’m working hard to remember to play after sessions. I may start reinforcing myself with chocolate. Lily is an incredible food motivated dog so I’ve purchased a food tug toy and a food lotus ball from clean run. She prefers the food ball but we are working to tug. I like this tug since the pouch is soft she seems to like the mouth feel. The lotus ball works great for small dogs and can be attached to fleece or a string. Happy training! 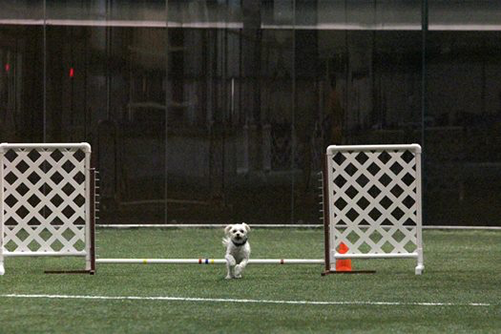 Here’s a recent photo of Lily at an agility trial from Don Farge, we’ve slowly been coming back to agility and it’s been a joy for both of us. A welcome diversion from the wait lists of nosework trials.